HARBIN – Millions of people in the northeastern Chinese city of Harbin endured a third day without tap water on Friday as fears of contaminated river water hit a second densely populated area in the country&#039s southwest. Officials said they expected a 80-km (50-mile) highly toxic slick of water on the Songhua river to flow past Harbin, a city of nine million and the capital of Heilongjiang province, by Saturday. An explosion 12 days ago at a petrochemical factory upstream poured an estimated 100 tonnes of benzene and other poisonous substances into the Songhua from which Harbin pumps its water. The city&#039s water company turned off the taps at midnight on Tuesday, and residents are getting by on stockpiled reserves and bottled water. Toxins carried in the river water flowing through Harbin on Friday were more than 30 times officially acceptable levels, but experts said the poisons should be diluted downstream where the Songhua converges with other rivers. More than 300 residents of Niujiadian village and Gou island in Harbin had to be evacuated before the slick passed by, the state media Life Daily said. Two reservoirs upstream discharged an unusually large volume of water into the river to dilute the spill, the Web site of the Harbin city government said. About 1,000 soldiers and paramilitary police have been deployed at several water plants to install charcoal filters that can more effectively absorb nitrobenzene, the main pollutant, it said. In the southwestern municipality of Chongqing, home to 32 million people, an explosion at a chemical plant this week forced evacuation of 6,000 riverside residents amid fears of benzene contamination, the state-controlled Southern Metropolis Daily reported. Environmental protection officials went from house to house in Dianjiang county warning residents not to use water from a nearby river, the daily said. Two schools had suspended classes. In a sign of how Harbin&#039s water crisis has jarred national nerves about widespread pollution, Premier Wen Jiabao has ordered authorities to ensure everyone has safe drinking water. The spill has served as a reminder that even as China has embraced the market, its Communist Party retains control over China&#039s citizens, and seizes every opportunity to reinforce its standing among the people. 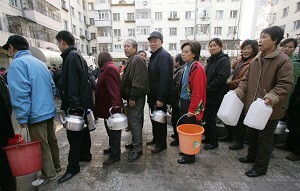 “After water was cut, the disadvantaged realise that at the crucial moment, we still must rely on the Party,” declared a headline in the Party-run Harbin Daily. The local government Web site said Harbin has stored 7,150 tonnes of safe water and asked neighbouring cities to stop trucking in bottled water. Jiamusi city, downstream from Harbin, has no plans to cut off water supplies because it uses underground water, the state-controlled Xinhua agency reported. The dominant sentiment in the city seemed to be grumbling resignation, not panic or outright anger at the government. “If I wanted to get angry, there&#039d be a lot more to be angry about,” said Sun Haifeng, an unemployed driver clutching an empty bucket and queueing for water. Most residents continued to work and shops and restaurants remained open. About 10,000 police patrolled the city&#039s streets, the state-controlled Beijing News said. Local hospitals had stockpiled antidotes to benzene-related poisoning, the state-run controlled Xinhua said. Officials warned residents to be on the lookout for symptoms of benzene poisoning, which can cause anaemia, other blood disorders and kidney and liver damage. The Nov. 13 explosion at Jilin Petrochemical Co. in neighbouring Jilin province was only a few hundred metres (yards) from the Songhua river. But at the time officials there warned only of air and ground contamination, not water pollution. China&#039s State Environmental Protection Administration has said the plant should be held responsible but rejected accusations that local authorities had waited too long before telling residents or Russia about the pollution. Russia&#039s environmental protection agency said it was worried the pollution might affect drinking water in its Khabarovsk region, which the Songhua enters several hundred kilometres (miles) downstream from Harbin.